November 19 is the date when American smokers are supposed to experience GAS, which is the American Cancer Society’s annual Great American Smokeout. The American Cancer Society (ACS) has been producing GAS for 34 years, during which time it has refused to acknowledge that tobacco harm reduction is a legitimate public health option. That’s the main reason GAS is just a lot of hot air. The response from the ACS and its vice president for epidemiology Michael Thun to this thoughtful treatise was a disservice to the millions of inveterate smokers in the U.S. who can not achieve complete abstinence from nicotine and tobacco. “Counseling” consists of giving smokers behavioral coping skills. ACS instructs smokers who are in desperate need of nicotine to “Take a walk, go get a drink of water.” In 1991, the National Cancer Institute told physicians to help their patients quit smoking by advising them to: 1) ”Keep your hands busy- doodle, knit, type a letter,” 2) ”Cut a drinking straw into cigarette-sized pieces and inhale air,” and 3) ”Keep a daydream ready to go.” I’ve never met a smoker who could daydream himself out of craving for a cigarette, and I’ve never met a physician who passes along these ridiculous tips. “Treatment” refers to pharmaceutical nicotine. In a prior post I discussed why these products fail to help smokers. They’re expensive, unsatisfying and most smokers have no interest in using them. If any other medication had the dismal 7% success rate of pharmaceutical nicotine products, the FDA would remove it from the market. The grim reality is that Dr. Thun’s approach is grossly inadequate. According to the 2006 National Institutes of Health (NIH) Consensus Conference on Tobacco Use, “…fewer than 5 percent [of smokers] succeed [in quitting] in any given year. Effective tobacco cessation interventions are available and could DOUBLE OR TRIPLE SUCCESS RATES…” (emphasis added). This means that providing Dr. Thun’s “conventional treatments” to all 45 million American smokers would help fewer than 15% – no more than 7 million – to quit. Dr. Thun has no plan for the other 38 million adult smokers, except denying them life-saving information about safer smokeless tobacco products. Dr. Thun understands the difference in risk between cigarettes and smokeless use; he served on a review panel for a National Cancer Institute-sponsored study which concluded that the health risks from the latter are at least 90% lower than those from smoking. However, he withholds this information from smokers because it might “postpone quitting.” He fears that smokeless will repeat the “fiasco of ‘Light’ and ‘Mild’ cigarettes,” which he characterizes as an industry-driven conspiracy. But that is only part of the story. ACS played a prominent role in the fiasco, publishing research in 1976 showing that light cigarettes were indeed safer. ACS investigators wrote that “total death rates, death rates from coronary heart disease, and death rates from lung cancer were somewhat lower for those who smoked ‘low’ tar-nicotine cigarettes than for those who smoked ‘high’ tar-nicotine cigarettes.” The ACS made a mistake with light cigarettes, but the scientific evidence for smokeless tobacco is unequivocal. Prohibitionists routinely stifle discussion by transforming every tobacco topic into a children's issue. Dr. Thun’s claim that “apple, peach, and mint” flavored smokeless tobaccos target children sets a new standard of insincerity. If he really believes that these are children’s flavors, Dr. Thun should campaign to eliminate them from alcoholic beverages, another cancer-causing adult-only consumer product. As with alcohol, tobacco manufacturers ought to be free to make their ST products appealing to adult tastes. Carping about flavored tobacco products is not responsible tobacco control; it is unwarranted harassment of adult consumers and the manufacturers who serve them. Tobacco initiation by young people should be stopped in its tracks, but the relative safety and palatability of ST isn’t a children’s issue. The 8 million Americans who will die from smoking-related illnesses in the next 20 years are not children today; they are adults, 35 years and older. Preventing youth access to tobacco is vitally important, but the Thun/ACS position on tobacco harm reduction effectively condemns millions of smoking parents and grandparents to premature death. If any other consumer product was as dangerous as cigarettes, society would demand safer alternatives. It is scandalous that the Cancer Society is not telling smokers the truth. 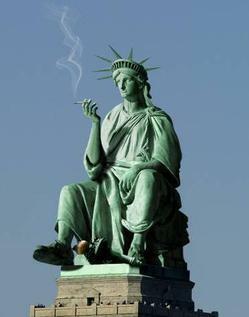 The pernicious and unmistakable march toward tobacco prohibition in the United States continues. 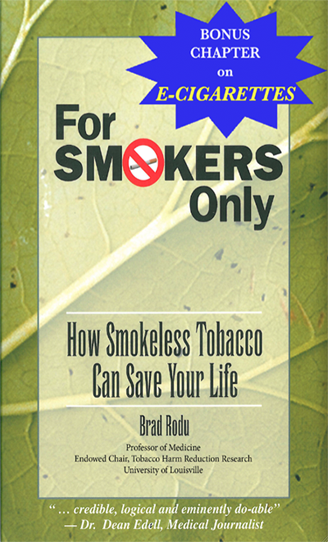 It is especially depressing that many of the nation’s colleges and universities, institutions that promote themselves as bastions of tolerance and diversity, have implemented not just indoor smoking bans (which have a solid scientific rationale) and outdoor smoking bans (which have virtually no scientific rationale), but universal bans of all tobacco products. Recently the University of Montana announced that it will impose a school-wide tobacco ban in 2011. The measure is the brainchild of a tobacco task force of misinformed public health activists such as Kari Harris, an associate professor of public health at the university. She said that the ban includes smokeless tobacco because just banning smoking would give students the message that it's safer to use other forms of tobacco. Harris concluded: “Is that the message we want to send?” Heaven forbid an institution of higher learning should provide students accurate information about tobacco use, one of the most important public health issues of our time. University officials feigned concern over this draconian proposal. Linda Green, director of health enhancement at UM and a Tobacco Task Force member, said she expects - and wants - to hear plenty from students, even if it's outrage. “This is new territory for us… We want to hear their concerns,” she said. Why are university officials eager to ban smokeless tobacco, a product that is about as safe to use as an automobile? How can the university enforce a ban on modern smokeless tobacco products, many of which are spit-free and invisible? Will campus police employ tobacco-sniffing dogs at security checkpoints? Will faculty and staff conduct random mouth checks before university lectures? How will the University of Montana resolve the inherent discrepancy between the tobacco ban and its policy on alcohol use (available here), a far more dangerous product? A comprehensive national review of alcohol use among college students found that 42% (3.8 million) consumed 5 or more drinks on an occasion in the past month. Thirty-one percent of college students (2.8 million) admitted to driving under the influence of alcohol in the past year. The review also found that over 500,000 college students are unintentionally injured every year because of alcohol and more than 600,000 were hit or assaulted by another drinking student. In total, over 1,700 college students died from alcohol-related motor vehicle accidents and other injuries. In summary, there is virtually no legitimate basis for American colleges and universities to prohibit the use of smokeless tobacco products. Furthermore, the imposition of tobacco bans are feel-good measures by and for health nannies, who neither have the means nor the fortitude to tackle far more important health risks facing our nation’s college population. The U.S. Centers for Disease Control and Prevention (CDC), provider of “official” statistics on American smokers, has generally reported a downward trend in adult smoking. For example, in 1998 the CDC said 24.1% of the population (47.2 million adults) smoked. By 2005, the CDC said the number had declined to 20.9% (45.1 million). Are CDC smoking estimates accurate? UAB epidemiologist Philip Cole and I asked this question in a new study, published in the European journal Public Health. In contrast to the decline reported by the CDC, we found evidence from another federal source that the number of adult smokers in the U.S. has been stable for about a decade. In 2005, for example, the CDC estimate was 45.1 million smokers; our analysis revealed that number could be as high as 54.2 million. The CDC uses two questions from the National Health Interview Survey (NHIS) to establish the smoking status of participants. The first question is, “Have you smoked at least 100 cigarettes in your entire life?” Subjects who answer “no” are never smokers, and those who answer “yes” are ever smokers. Ever smokers are asked a second question: “Do you now smoke cigarettes every day, some days, or not at all?” Respondents who answer “every day” or “some days” are current smokers; those who answer “not at all” are former smokers. We used the National Survey on Drug Use and Health (NSDUH), which is sponsored by the Substance Abuse and Mental Health Services Administration (SAMHSA). Although NHIS and NSDUH survey data on adult smoking have been available for many years, no government agency has ever directly compared them. The Office of Applied Studies at SAMHSA acknowledged differences in the two surveys, but it offered no explanation for the discrepancy. NSDUH asks a 100-cigarette lifetime question that is identical to NHIS. But NSDUH does not ask about every-day or some-day smoking. Instead, it asks questions about smoking in the past 30 days, which the CDC counts as current smoking. If subjects reported that they had smoked on all 30 days we called them every-day smokers; if they had smoked on 1 to 29 days, we called them some-day smokers. We found that NHIS and NSDUH describe an increasingly divergent picture of smoking in the U.S. over the 1998-2005 period. In 1998, smoking prevalence in both surveys was 24%. By 2005, NHIS prevalence had declined to 21%. But the NSDUH estimate was 25%, suggesting no change. The difference is not trivial: NSDUH’s 4.5% higher estimate in 2005 amounted to 9.1 million more smokers than the NHIS estimate. Higher smoking prevalence estimates in NSDUH are largely due to much higher estimates for some-day smoking. This is not surprising, because NSDUH surveys included as some-day smokers persons who smoked as infrequently as one day in the past month. In the 2005 NSDUH, one-quarter of 18-34 year old some-day smokers and almost one-third of 35+ year-old some-day smokers smoked only on 1 to 4 days in the past month. If these very occasional smokers had been subjects in the 2005 NHIS survey, perhaps they would not have been counted as smoking at all. Our findings are consistent with a recent study of college students who smoked at least one cigarette in the past 30 days, 50% of whom denied being smokers. Among the deniers, about 70% smoked on only 5 or fewer days in the past month. Cigarette smoking has been described in many government publications as “the single most preventable cause of disease and death in the United States.” But in order to estimate accurately the consequences of smoking, it is necessary for the government to count smokers accurately. It is surprising that the CDC counts smokers using only one source, the NHIS survey, and that little research has been conducted to assess its accuracy. Our study raises doubt about the CDC’s claim of a recent decline in smoking. Investigation of this discrepancy by federal survey administrators may lead to better surveys and an improved understanding of American smoking trends.